So I made the mistake of asking kid#1 what he wanted for dinner. Sunday dinner is the one day in the week that I cook for the family, and he knows this is the time I usually experiment with recipes. So kid#1’s request was opportunistic and he knew I wouldn’t hold back from the challenge of making a low carb version of gumbo. I do love gumbo myself although I haven’t had it in years. Oddly enough, the best gumbo I ever remember eating was in Kentucky. I remember that was after the longest birthday of my life (I travelled for about 30 hours from Singapore to Moscow, then Houston and finally Kentucky and it was still my birthday when I got there!). When I got to Kentucky I realized I was taken off guard by unseasonably cold weather. And I braved the cold to walk to a restaurant and the gumbo was such a wonder of warm, thick and flavorful comfort, that I have always had a soft spot for gumbo ever since. Gumbo is a stew that originated in Louisiana and is notable for the roux that is the start of the dish. The tricky thing about roux is that flour is usually high carb, and I used some low carb flour to substitute. I’ve seen recipes using almond flour but I think the flavour and texture may not quite be the same. Secondly, roux cannot be added into the Instant Pot at the beginning of the cooking as it tends to burn. So for this recipe, I added the roux in later as a thickener. 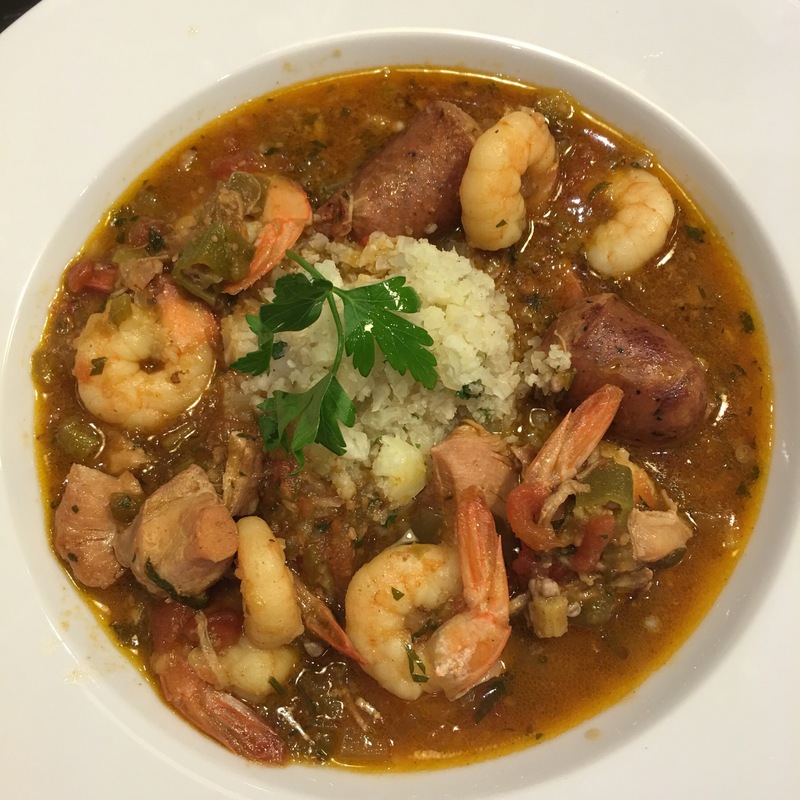 Gumbo usually takes several hours of simmering but using the Instant Pot makes this a quick fix for dinner. The other thing I had to bend backwards for this recipe was looking for gumbo file powder. This is the dried and ground sassafras leaves which gives a distinctive earthy flavor and also helps to thicken up the gumbo. The file powder comes from the leaves but not the bark of the tree – apparently the bark contains safrole, which is carcinogenic. Surprisingly I managed to find it in Cold Storage, which is probably why I still go to this pricey supermarket occasionally. Which now brings my spice collection to 34 spices now…I think it’s time again to go clean up my spice drawer. Anyway doing this gumbo recipe was fun. This stew is such a clash of influences – French, Cajun and Creole that I am somewhat reminded of our own melting pot of cultures in Singapore. Interestingly enough I don’t think we have the one dish to rule them all in Singapore – our iconic dishes like Hainanese Chicken Rice, Roti Prata and Mee Siam still represent individual Chinese, Indian and Malay cultures. Probably the closest would be Peranakan food, which is because of a blending of Malay and Chinese cultures from intermarriage over the past couple of centuries. Sauté the vegetables for about 5 minutes till fragrant and slightly caramelized. Add the chicken and sausage back into the pot. Add the chicken stock and the can of diced tomatoes in their juice. Add the bay leaves, spices (paprika, cayenne pepper, dried thyme, dried oregano, garlic powder and crushed red pepper) and stir through. Turn off the sauté mode and close the pot. Put valve in sealed position. Pressure cook for 15 minutes. Use quick pressure release. Turn the pot back onto sauté mode. Add the okra into the gumbo. In the meantime, in a saucepan, heat up the 1/4 cup of oil and add the low carb flour. Stir continuously till the roux browns slightly. Add 2 ladles of liquid from the Instant Pot into the roux and keep stirring till thickened. Add the roux mixture back into the Instant Pot. Stir through and add the shrimps, gumbo file powder and parsley in. Cook for another 5 – 10 minutes and turn off the pot. For the cauliflower rice, use the food processor to chop the florets into small rice-like pellets. Sauté the onions till fragrant and translucent. Add the cauliflower and continue to sauté. Add the salt and pepper to taste. Add the parsley and stir through. To plate up the gumbo, put a large scoop of cauliflower rice at the center of a shallow bowl or soup plate. Spoon the gumbo around the cauliflower rice and serve hot. Looks good but I have a question (could probably find an answer with a Google search, but am asking you…) What is “low carb flour”? Almond, coconut, or what??? There is low carb flour from LC foods or Bob’s Red Mill. I plan to just use Xanthan gum. A very little goes a very long way and its very low carb- 1 gram per .25 tsp. You only need about .5 tsp for an entire crock pot! Yes xanthan gum is also good for thickening. What flour did you use for this particular recipe? I had a commercial low carb flour (Bob’s Red Mill). But alternatives that are good low carb options are almond meal or xanthan gum. What is the net carb count? What if you don’t have an instant pot? It shouldn’t be difficult. I would do the chicken and shrimp gumbo on the stove; it would probably take about 1/2 hour or so. My wife and I substituted 3/4 of a teaspoon of Xanthum Gum instead of the roux to get rid of the majority of the carbs about two minutes before the very end of the final sauté and it turned out great.